Scroll down for more info on some of these revolutionary green building technologies! We can develop self-sustainable commercial and residential properties with little to no environmental impact. Why ReddiForm Insulated Concrete Forms? Reddiform Blocks in Action Photo Gallery! Coolerado manufactures and markets innovative air conditioning systems for commercial, government, and military use. Based on our proprietary, patented, and proven technology our products use as little as 10% of the energy required by the most efficient conventional systems. Our products dramatically reduce customers’ energy consumption, while creating a healthier environment by delivering 100% fresh air and flushing out stale air and pollutants. A single Coolerado unit can cool 3,000 sq/ft of building space, using as little as 1/3 the power of a standard hand-held hair dryer. Compared to many conventional systems, this can be a savings of up to 90% in energy costs, with a reduction in greenhouse gases from generating that power. 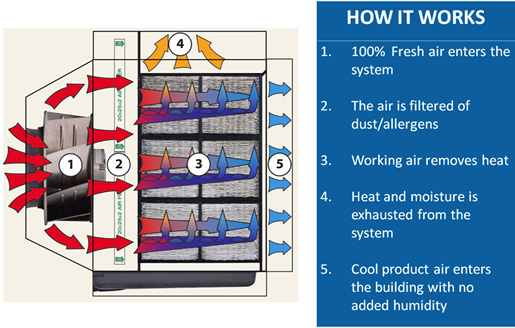 Out with the hot air, in with the cool air; Attic Ventilation does this and more. By providing constant steady air flow throughout your attic, stale warm air is vented out giving more room for fresh cool air, also known as “air exchange.” Your attic should never be hotter than 10-25° above the outside air temperature in the summer time. A well-ventilated attic will help reduce your energy costs and reduce the temperature in your home in the summer, and keep your home warmer in the winter because the insulation will be dryer thus improving the R Value. Installing a certified Solaro Aire™ on your roof can be very beneficial for your home. Our energy efficient Solar Powered Attic Fan operates during the day, completely powered by the sun, extracting the warm air from your attic. During the hot summer months, your attic can reach temperatures of 160°F and above. The Solaro Aire™ Attic Ventilation Fan works by expelling this hot air and returning your attic’s space closer to the outside ambient temperature. The Solaro Aire™ operates completely off solar energy, pulling the outside air in through existing static and soffit vents. By pulling from this external air source, the attic fan will extract the hot, humid air up through the fan and create a constant exchange of air in your attic. In the colder winter months, warm moist air rises from inside your home and collides with the cold underside of the roof. The Solaro Aire™ provides circulation that prevents the moist air from condensing on the surface, keeping your attic cooler and drier. By installing a Solaro Aire™ you will not only be creating a more pleasant living space but you will be protecting your roof, framing and attic from excessive heat and moisture. Behind the Solaro Day™’s acrylic diffuser are individual Opto Semiconductors, designed with the highest quality and latest technology. Better known as light emitting diodes (LEDs), only a few millimeters in length, converts electrical energy directly into light. From the Solaro multicrystalline solar panels, the sun’s energy is converted into safe low-voltage, high performing simulated daylight. Step 1: Starting out on the roof, a simply installed solar panel collects the sunlight’s energy, even on cloudy days, and converts it into safe low voltage DC power. Step 2: The power is then transferred down through your attic using our durable interconnect cabling. A small ¼” diameter hole is all that’s needed in the roof. Step 3: The Solaro Day™ is installed just like any other light fixture, in any location! Simulated natural sunlight into your home or office, completely powered by the sun. Solatube Daylighting Systems use breakthrough optical technologies to pipe pure, natural light indoors. From sunup to sundown, daylight is harvested by our patented rooftop dome and transferred to your home through the world’s most reflective tubing. Specially designed lenses then evenly disperse the sunlight throughout your room so you can see better, accomplish more and live better.